December 16, 2016 by Nils Oudhuis . 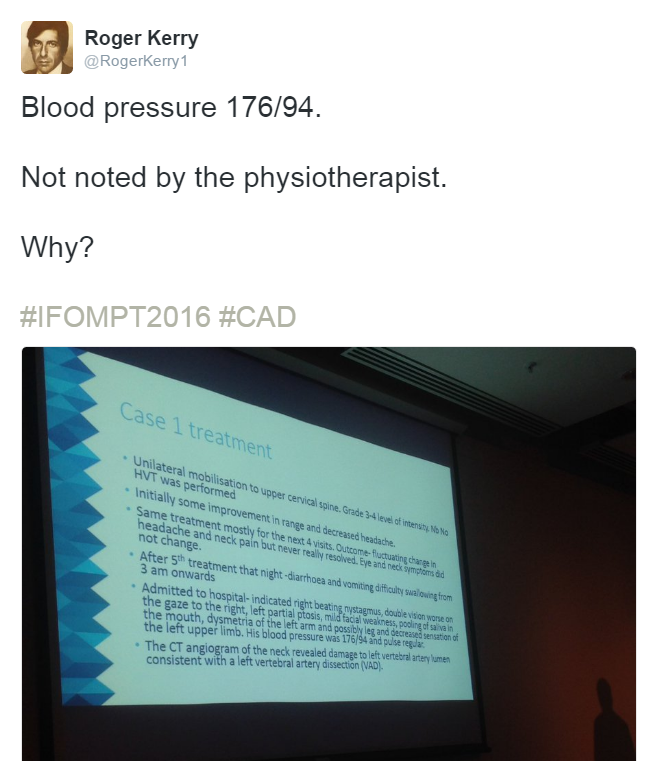 He is one of the world’s leading expert on the topic of Cervical Artery Dysfunction (CAD). 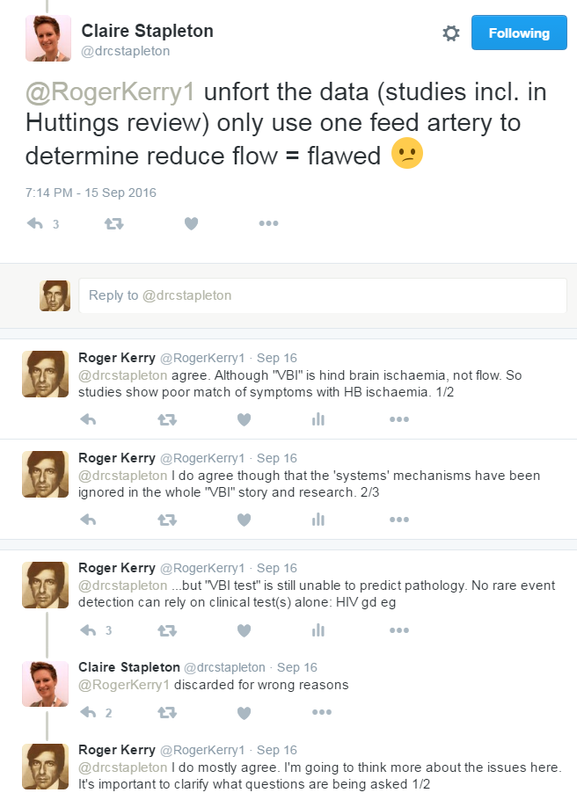 Roger Kerry is Associate Professor in the Faculty of Medicine and Health Sciences at the University of Nottingham, UK. He is a qualified Chartered Physiotherapist, and an honorary Fellow of the UK’s Musculoskeletal Association of Chartered Physiotherapists. His main clinical research interests have been in adverse events and physiotherapy interventions of the head and neck, particularly on the causal nature of the interventions. Roger is also undertaking research activity in the area of Philosophy of Science, investigating the nature of causation in the health sciences. He is well- published in these areas and has been an invited speaker at numerous international conferences. This discussion has been going on for years, and I have never really understood why. Maybe I’m guilty in some way of fuelling it, but all our work (co-lead by Alan Taylor, for example) has been to try and cast some clarity on a grey area in order to increase comfort and dissolve any worries and myths, see here, for example. It appears we have failed. Miserably. So, as we enter another new year, I will try and bring us all up to date with my view of the world of adverse events and management of people with head and neck pain. I guess the clinical concern has always been that we don’t want to do harm. That’s fine. But given the rate of event we are talking about here, it is extremely unlikely that an adverse event would be witnessed by encouraging movement of the head and neck. Accurate figures are near impossible to establish (a consequence of the rarity), but we could say that something like 6 in 100,000 adverse events occur annually which may or may not be associated with therapeutic techniques for people with pain and dysfunction of their head and neck. This is low rate stuff. Despite this, there still seems some anxiety with cases and discussions being reported, calls for therapeutic interventions being abandoned because of risk, and anti-therapy militia ferociously blogging about the evil insurgents whose blind destiny it clearly is to neurologically compromise all who are stupid enough to fall for the trap of seeking their “care” (just Google ‘spinal manipulation harm’). So what can we say about all this? In this blog I will say a few things that I have said before, and then try and make some conclusions to take us forward. Here’s one thing I have said before: THIS IS NOT ABOUT MANIPULATION. If you don’t like manipulation techniques (whatever they might even be) and want to see them wiped off the face of the Earth, fine. Get rid of them. But get rid of them on the grounds on ineffectiveness, not risk, if that’s the case. Manipulations do not cause adverse events. Here’s why I say this. THE EPIDEMIOLOGY: Risk of stroke in non-manipulation population = 1:100,000. Risk of stroke in manipulation population = 6:100,000. Absolute risk = 0.005%. That is not an epidemiological risk. THE MECHANISMS: Although numerous studies have demonstrated that vessel stress is influenced by head and neck movement, studies which have focussed on manipulative thrust have failed to identify that the defining characteristics of a “manipulation” have any influence on vessel stress. It is therefore difficult to make a case for manipulation being a risk factor for stroke. Interestingly, this was published just recently claiming no evidence of a causal association between manipulation and carotid stroke, adding to a line of similar findings. I have also said this before: IT IS NOT ABOUT THE VERTERBRAL ARTERY and IT IS NOT ABOUT DISSECTION. These are two (very small) component parts of an anatomical and pathological system which we have referred to as CERVICAL ARTERY DYSFUNCTION (first documented here). This means that when we talk about risk of neurovascular adverse event relevant to therapy, we are talking about, at least, the vertrebrobasilar system (posterior) (less so) AND the carotid system (anterior) (more so). And we are talking about a range of pathologies including, at least, dissection (less so) AND atherosclerosis, thrombosis, external compromise, embolic events, etc (more so). 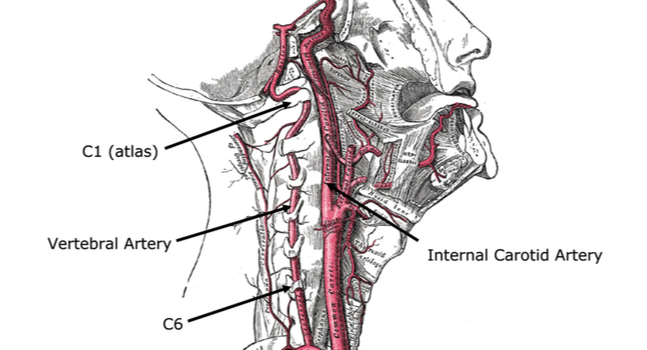 Vertebral artery dissection is not a common cause of stroke. 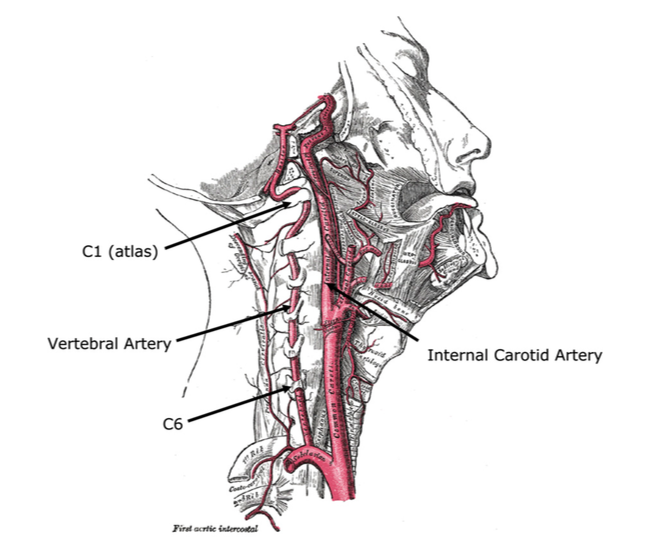 Carotid atherosclerosis is a far more common cause of stroke. Both can present as headache and neck pain in their early stages. Anyhow, despite the old “it’s not about manipulation” line, some people do experience adverse neurovascular responses (e.g. stroke) after visiting therapists (physiotherapists, osteopaths, chiropractors etc) (but it’s not the manipulation that is the causal factor). Further, some people experience strokes of similar mechanisms when doing other stuff with their heads and necks, like having their hair washed, or looking up, and so forth (no manipulation there then). So there seems to be something about head-neck movement (but it isn’t manipulation) (which we know by blood flow studies on normal and non-manipulative movement), and about some people which could be more convincing risk factors for stroke. We know that movement towards end-of-range can affect vessel stress (contra-lateral rotation for vertebral artery, extension for internal carotid artery). AND THIS IS NORMAL. AND FINE. AND DANDY. Our wonderful vessels can tolerate this. Unless there is some pre-disposing factors affecting the physiological functions of the vessels, namely endothelial dysfunction. Hence, this issue now become MORE ABOUT THE PERSON AND LESS ABOUT THE INTERVENTION. It is reasonable to suggest that the majority of published cases associating adverse event to intervention are in-fact cases whereby the patient was presenting to the therapist with early signs of stroke, that is head and neck pain. The procedures undertaken by the therapist (which could be assessment, positioning, exercise advice, manual therapy) may well contribute or exacerbate the inevitable, but they are most likely not the cause of the event. So if this is about the person, how can we identify those people either AT RISK OF STROKE or PRESENTING WITH EARLY SIGNS OF STROKE? That’s not too easy. We have developed a framework to work within for this end, exemplified by the international IFOMPT document, and associated papers. Even so, this is not a clear cut process. In brief, we advocate (based on the totality of all relevant evidence) that risk factors for stroke should be consider when considering risk factors for stroke. Although in some cases (e.g. spontaneous dissection in young people), such risk factors are often absent, by-and-large in populations of people who have stroke from other cervical causes, they are present. These includes family history of early cardio-vascular disease, previous history of such, hypertension, hypercholesterolemia, etc etc (see IFOMPT etc, and) – you know, the stuff we regularly consider as cardio-vascular risk factors. If stroke is presenting in its early stages, then cranial nerve function might be affected, so check them OK. I do totally appreciate what Claire is saying and have pondered with constructing some smart-arse response based on compensatory flow, no supporting epidemiology etc, but this is a fair point which may require further thought. However, I still force the point that there is probably richer information to be gained from the patient and their history than from an isolated test – especially given the low prevalence condition (beware the base rate fallacy).